When he was working, which was always, Glenn Parks smelled of diesel fuel, malva weed, stale coffee, and the half-dozen dogs that perched in the back of his primeval jeep atop rolls of barbed wire, bales of bean straw, pipe wrenches, and a deer rifle. As kids in the 1960s, we loved the hand-painted sign on a tin shed next to our great-grandaunt’s old redwood barn on the Corral Canyon creek bank that read “Glenn’s Fix-It Shop.” A huge sycamore tree shaded Glenn’s malodorous workshop and parts-storage yard, which also served as his pigs’ pen. They were always covered with manure, parading between jars of rusting nails, piles of pipe fittings, and mountains of indistinguishable pieces of old tractors and farm implements. 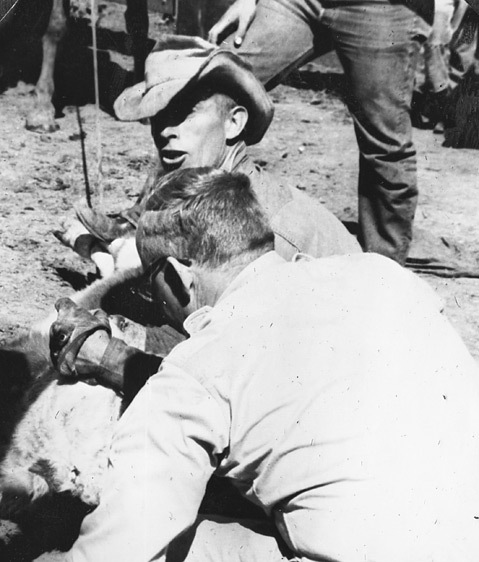 Glenn Parks (in hat) in the Orella Ranch corrals, 1961. Glenn dry-farmed garbanzos right to the edge of the ocean terraces above Refugio Beach, where the plants could soak moisture from the summer fog. He showed us where rattlesnakes, black as the soil, lay coiled under the bean plants’ leaves on summer afternoons. He also kept a few cattle, on hills that were too steep to farm. We called one Limpy because of her gait. She loved to chase people, but Glenn kept her because she calved every year and he liked her orneriness. He taught us to sidestep when she’d charge us, just like bullfighters. Glenn Parks was born in Cottage Hospital and grew up on his grandparents’ hay farm west of Las Positas Road before it was developed into the golf course and showgrounds (now Earl Warren Showgrounds). He sold fruit from his homemade stand on rural Modoc Road during the Depression. As soon as he finished Santa Barbara High School, in 1939, he bought a used tractor and baled hay for Goleta farmers. Glenn met Marilyn Hughes on a hay ride, and they wanted to marry quickly, so he borrowed $1,000 against his $1,000 tractor. In 1946, the newlyweds moved into an old farmhouse on Storke Road, where they raised beans for Tom Storke. The Parkses made good neighbors. When the four Parks children were small, my grandparents gave them milk from their cow, and then the cow herself. When my grandfather had a heart attack a few years later, Glenn not only finished my grandparents’ farming for the year but planted Sudan grass, too, so their cattle would have summer feed. In the early 1960s, Charlie Dal Pozzo raised lemons in Refugio Canyon and convinced Glenn to switch from garbanzos to lemons in Corral Canyon. Glenn planted avocado trees as windbreaks around his new lemon orchards. When he saw how profitable the avocados were, he replaced the lemons with avocados. He soon leased the larger Tajiguas and El Capitan ranches, and later the Dohenys’ Las Varas and our La Paloma ranches, planting all in avocados. He proudly painted “sharecropper” on his pickup door. Glenn was almost 50 before Glenn and Marilyn could first afford to buy their own ranch. They bought the same Las Varas Canyon ranches that they’d sharecropped for years. Success after success followed, and they expanded their farming many times to tens of thousands of avocado trees. Glenn’s success became legendary, and he served on state commissions and advised growers around California and in Mexico. Marilyn died last October after 66 years of marriage. Glenn was 91 when died at his ranch on January 10. A few years ago, I stood in front of our old granary, talking with Glenn in the same place where 40 years before he’d shown me how to sidestep Limpy. Glenn was in his pickup, alone except for his dogs and a deer rifle. The summer evening’s north wind was beginning its dance down the south face of the Santa Ynez range behind us, making its way seaward down our canyon, rustling the dark green leaves on rows and rows of avocado trees. “How did you do all of this,” I asked, “working so hard all your life, much of it on other people’s land?” Glenn was wistful, and while he looked at me, I think he was really seeing my grandfather; we were surrounded by the hills where they had together farmed limas, garbanzos, tomatoes, and cattle in the 1940s and ’50s.